ACL, MCL, LCL ligament injury / surgery rehabilitation that provides medial, lateral, and rotational support of the knee joint while accelerating recovery by up to 50%. Provides gait correcting, leg strengthening rehabilitative therapy to prehabilitate a weakened OA leg prior to Total Knee Replacement (TKA) surgery. When applied several weeks prior to TKA, the weakened OA leg can be significantly strengthened and gait can be normalized prior to the surgery to accelerate recovery and improve overall patient outcomes. Post surgically, the brace is used to manage pain and inflammation and to eliminate quadriceps avoidance gait to accelerate recovery. Gait correcting, leg strengthening, ambulating RehabilitatorÔ therapy is clinically proven to accelerate recovery from knee injury / surgery or to strengthen a weakened leg. The pneumatic air bladders on both sides of the knee joint provide excellent medial, lateral, and rotational control of the knee. When inflated, the air bladders provide therapeutic compression at the knee to reduce or eliminate knee pain and to effectively manage knee joint inflammation. The active swing assist eliminates quadriceps avoidance gait, increasing quadriceps firing to significantly increase quad strength over time. The gait correcting, leg strengthening Sport RehabilitatorÔ can accelerate recovery post injury / surgery by up to 50%. The Sport RehabilitatorÔ uses pneumatic control of the knee joint allowing the brace to be significantly lower profile than competitive ligament braces. The 11-inch-long Sport RehabilitatorÔ has a semi-rigid frame and a rotating anterior thigh cuff. The lower profile design combined with the flexible frame and air bladder system provides superior comfort and brace migration control. For Total Knee Replacement prehabilitation, the Sport RehabilitatorÔ is provided 4 to 12 weeks prior to surgery to strengthen the weakened OA leg and normalize gait prior to the surgery. Case studies demonstrate superior leg strength after 6 weeks of Sport RehabilitatorÔ use compared to 6 weeks of home exercise or physical therapy prior to TKA surgery. Optimal leg strengthening pre-surgery should include RehabilitatorÔ use as well as home exercise or physical therapy. Post surgically, the RehabilitatorÔ is used to manage knee pain, control inflammation, and eliminate quadriceps avoidance gait to strengthen the leg post surgically. The gait correcting, leg strengthening RehabilitatorÔ accelerates recovery post TKA and significantly improves patient outcomes by enhancing leg strengthening and normalizing gait. Before trying this brace I could not walk without pain. I had gained a lot of weight from lack of exercise. I did not want to have surgery. I tried this brace and it changed my life. I wore it everyday and immediately felt more steady on my feet. The support of my knee was incredible and I could walk with very little discomfort. After wearing the brace for about 3 months I realized that I could go out at night and not wear the brace and be in no pain. My leg had become much stronger and I could now walk more even without the brace and NO PAIN! I still wear the brace if I'm going on long hikes or exercising for support. It's incredible. I have put off my surgery for now! Playing Golf Again Pain Free! Before using the Guardian Sport Rehabilitator knee brace playing a round of golf would cause me significant knee pain. The torque and twisting motion of a golf swing would be extremely painful on my knee. The Guardian knee brace comfortably provides support and stability to my knee during my golf swing. The extensive walking required to play golf would also cause a great deal of knee pain which would usually persist several hours after finishing the round. The pain would be intensified particularly when I would have to walk down a hillside or small incline. My knee would feel weak and vulnerable due to the force and impact of walking downhill. 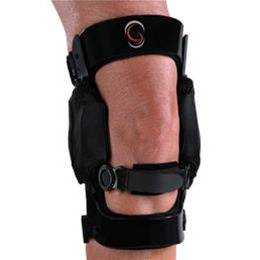 While wearing the Guardian knee brace my knee feels securely in place with no feeling of weakness. More importantly there is no knee pain while walking down hillsides or while walking in general. With the Guardian knee brace I can now play a round of golf free from knee pain. I don’t have knee pain during the round of golf or after the round once I remove the knee brace. 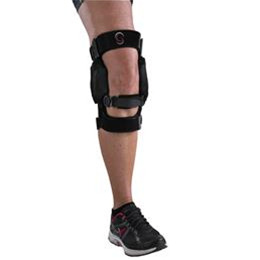 When I wear the Guardian knee brace my knee feels strong and supported. It feels great to be active and not have to worry about the pain or potential injury. Kevin K.